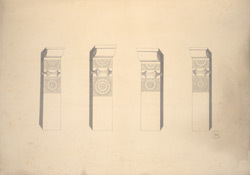 Pencil drawing of pilasters from Cave 1 at Ajanta, from an Album of 26 ground plans of the Ajanta caves and 16 folios of drawings of sculpture and architectural details in the Ajanta caves, by Capt. R. Gill, dated c.1850. excavated between the second - first centuries BC; then, after a period of more than six centuries, the excavations restarted around the fifth century AD, in the Vakataka period. Cave 1, excavated in the late fifth century, is one of the finest monastery. The architects of the early Mahayana caves at Ajanta created pilasters of severe designs but under the Vakataka patronage a new form started to develop characterised by the lotus-medallion motif as depicted in the pilasters in this drawing. The shafts are elaborately carved with exuberant medallions adorned with scrollwork, makaras, aquatic monsters with foliated tails and fluting motifs. This is the first vihara that incorporates this kind of pilasters.